Dark Ripples in Time – Black Metal Moments from the Past is a new CVLT Nation series featuring interviews from the ’90s, never before published on the web until now. From deep beneath the state of Florida, burning currents of an underground river rush to the surface, drowning the world in howling, black waters. Out of the waves of this desolate flood walks frontman and bassist, Vincent Crowley, a priest of the Church of Satan. His band, Acheron, cloaks the heart of LaVeyian Satanism within the diabolical drapery of Black Metal. In addition to Crowley, the current line-up includes lead guitarist Trebor Ladres, Michael Browning on drums, and Peter H. Gilmore (editor of the Black Flame) on keyboard orchestra. The present Satanic pact has brought the band to a new plateau of Death Metal deviltry. 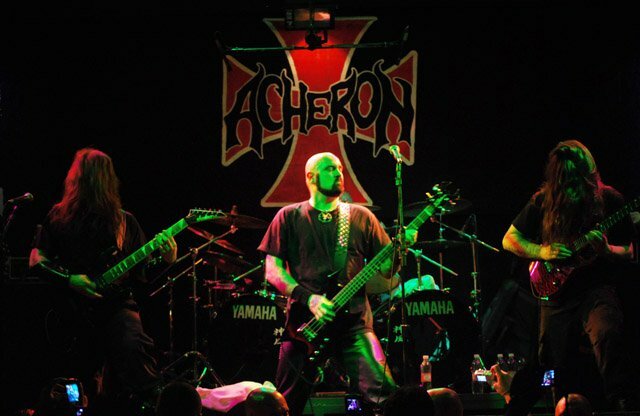 Since the band’s conception in ‘88, Acheron has unrepentantly unleashed three full albums upon an unsuspecting world. 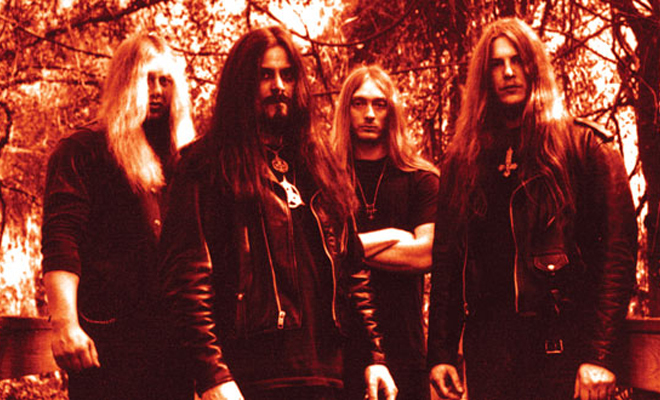 Their first cloven effort, Rites of the Black Mass, was the first metal recording to incorporate texts from a traditional Black Mass with symphonic guitar fury. Their second Satanic attempt, Lex Talionis, did not go unpraised. Hail Victory! is Acheron’s third blasphemous release, continuing their interpretation of the classic brimstone sound. 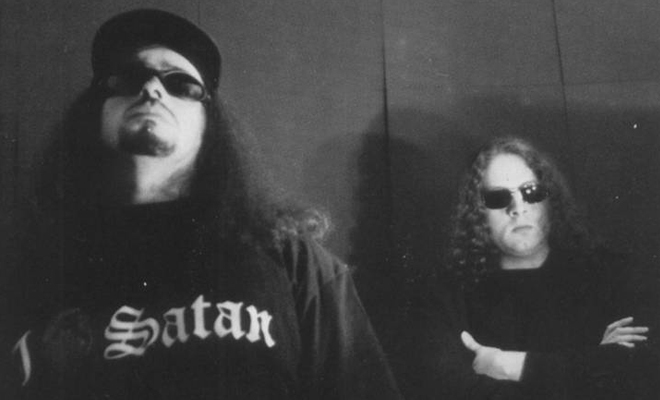 The band has also made several impish appearances on compilations including the song “Slaughterization for Satan” on the European version of Nuclear Blast’s Death is Only the Beginning 3. Acheron’s talons also clutch two 7 inch singles- Messe Noir on Reaper Records and Alla Xul on blood red wax from Metal Merchant. The stars are right and Vincent Crowley is ready to stalk the mortal realm. He has shown many times that he is always unafraid to speak his voice on subjects close to his black heart. With the approach of the Satanic Millennium, Crowley has begun to arm himself for the coming conflict; a hungry wolf ready to devour a world of sheep awaiting slaughter. What is the meaning of Acheron and what is the origination of the word? Acheron is the River of Woe in Greek Mythology that was said to lead to Hades. A boatman named Charon would use this river to take the dead across. I personally liked the name a lot, so I used it for the band’s name. When and why did you join the Church of Satan? Peter H. Gilmore, who was part of the priesthood at that time. The reason I got involved was because of its non-deity, self preservation, elitist view. And, even though it was an organization, it did not cater to herd mentality. The Church of Satan is a powerful idea, not a farm for sheep. Dr. LaVey made me a part of the Satanic priesthood last October. Do you believe in the existence of Christianity’s God and Devil? Then why do you use Satanic imagery in your lyrics? Christianity is just another form of mythology but, unfortunately, it has been cloaked to the masses. Satan is an archetype. It is a character I resonate to. Satan symbolizes power, knowledge, freedom, gratification, strength and wisdom. I do believe in a dark force, but it is not good or evil. It is like the Ying and Yang symbol. There is no good or evil in my world, just reality. Christians have labeled me as being “evil” and I wear the label proudly, since I think that their religion is a joke. But who can put boundaries on life? Lyrically, I write whatever gives me pleasure. The darkside is my vice. I understand that you have a child. Do you plan to raise her in the Church of Satan? If so, isn’t that the same thing as someone raising their child to be a Christian? My child will obviously be raised with Satanic values but the path she chooses to take will be up to her. You are born a Satanist, not forced to be one. She will understand my views, along with many others. The only ideas that I will instill in her are intelligence, creativity, strength, and an iron will. She will be allowed to read the Holy Bible because it shows what a hypocrisy it truly is. What does your wife think of all this? Is she a member of the Church of Satan? She thinks the same way I do. She is a Satanic Witch and is a member of the Church of Satan. I don’t think I could have ever chosen a mate that was not on the same wavelengths as myself. You could call it unholy matrimony. Are you involved with the occult? Do you have a Satanic alter? Is so, and you don’t actually believe in the existence of the Devil, what is the point? Yes, I am into the occult and have an alter. While it is true that I do not believe in an anthropomorphic being I do believe in a force. I have worked with magick for a number of years and it works very well. Even if the ritual is not successful, it is a very therapeutic exercise that helps release emotions that need to be expelled. The alter is a focus point, not a shrine to a higher being. Diabolos Rex did the artwork for Hail Victory. 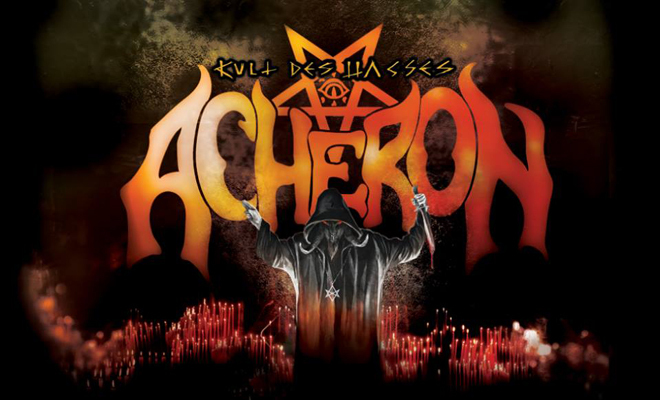 Hasn’t he done some other artwork for Acheron? Diabolos Rex has done all of our album covers, except for Alla Xul which was a 7 inch. He is also a part of the Church of Satan priesthood and is an incredible artist. Our upcoming release, Those Who Have Risen, will also be done by him, if all goes well. Rex is a true comrade. Who is Alla Xul? What is the origination of this word? In Sumerian, Alla Xul means evil god. It was taken from the Necronomicon. The story behind the song is about a magician who uses an incantation to invoke an abomination so he can obtain his desires. Why do you chose to side with the darkness? It is in me instinctively. My favorite color has always been black. I am up all night and sleep during the daylight hours. I feel a kindred spirit for Old Nick. This is the way I have always been. Even when I was young and going to the Christian church my parents forced me to attend, I always had a fascination for the dark side. Have you had any negative experiences as a result of your fondness for darkness? Oh, of course, but lessons must be learned somehow. Let’s just say I am very cautious of who I work magickally with. I really prefer to do rituals alone. One weak link in the chain is all one needs for a problem. Satanism takes study, not faith- it is only for true warlocks and witches. Tell me about your publication, Wolf-Age. The first volume of Wolf-Age was the forum for the Order of the Evil Eye, which I founded. Each issue featured many Anti-Christian and Satanic thoughts, rituals, news clippings, and other items. There are six issues in volume one. Since the Order has been put to rest, I probably won’t do any more. However, I still sell the first six issues to those who are interested. What was the Order of the Evil Eye? It was a Satanic/Anti-Christian organization. We went head to head with many Christian groups and individuals to defend our freedom. Several months ago I disbanded the organization, because I no longer want to give credence to a religion that is already destroying itself. I had fun doing it for a while, but believe me, I will not be a martyr for any cause. 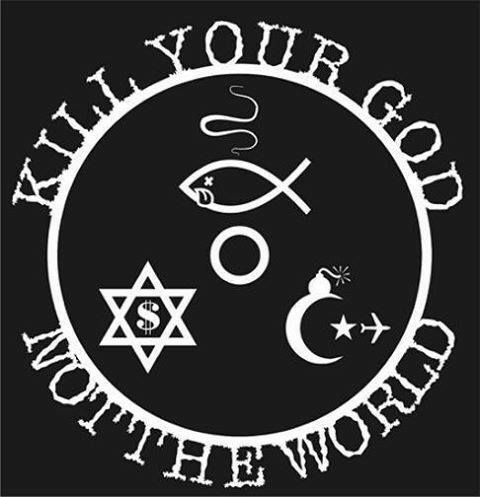 I still think that Christianity is a dangerous cult but I no longer waste my energy. My music is the most Satanic part of me and it is now time to focus towards that direction. I understand Acheron’s Those Who Have Risen will feature songs expounding on the mythos of the Temple of the Vampire. What is this temple and what are their beliefs? When is this CD scheduled for release? The Temple of the Vampire is an ancient magickal society of real vampiric magick. It stems from the Order of the Dragon and Hekal Tiamat. Unlike the traditional blood drinking vampires, members drain vital energy, called Lifeforce, from their victims. The Chinese have called this energy “Chi” for thousands of years. I am a member of the priesthood of Ur, which is an inner order within the Temple. We are going to start recording Whose Who Have Risen this December. It will be released on Evil Omen Records, a sub-label of Osmose Productions. The track listing will contain “Hekal Tiamat”, “Necromanteion Communion”, “Lifeforce”, “Shurpu Kishpu”, “Final Harvest”, and a cover of “Total War” by Boyd Rice of NON. What are some of the band’s musical influences? We have all sorts of influences. Mine are Venom, Celtic Frost, Bathory, Black Sabbath, Mercyful Fate/King Diamond, Alice Cooper, Sodom, Slayer, and Possessed. I also enjoy classical music and opera. Do all the members of Acheron belong to the Church of Satan? Everyone in the present line-up is a Satanist. In the past I have played with musicians who just used it as a way to get in the band, but eventually they always show their true nature. No one is forced to become a Church of Satan member. Any plans for an American tour? Yes, we have put off touring for too long. I think it is time to go out and meet all those people who have supported us for so long. My goal is to be able to use our whole stage show- Lifeforce flows at live performances! I ask everyone of the Wolfen Brood to pick up our albums and come see us when we come to their town. Keep the black flame of Satan burning! Hail Victory!